Director Michaelangelo Frammartino is said to have stated at the film's public festival screening, "The audience must do the work." This may sound like a challenge, and it is, but the reward reaped is bountiful. Virtually free of dialogue, The Four Times unfolds ever so slowly, drawing the audience into a completely immersive experience. Rife with dry, yet surreal, humour, an elderly shepherd passes on and we see his spirit pass into a newborn baby goat, a tree, a lump of coal and finally, dust evaporated into the air. It's a simple setup for a story, but Frammartino holds the viewer's interest with such compelling imagery that it's a sight to behold. The first half-hour of the film may have viewers wondering exactly what course the film is taking, and what they will take away from it. But stay with it — even as each scene is a singular masterpiece, it takes well into the film's refreshingly brief 90-minute run time to begin to discover the "story." Once the spirit journey becomes clear, the cohesive whole of the film takes hold. 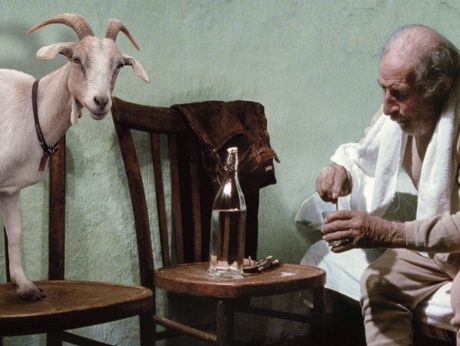 Watching the shepherd's final days, along with his ceremonious end, puts the viewer in the camera's eye, as Frammartino allows long, lingering shots to incredibly stage minor miracles and catastrophes. The animal work is especially stunning, with such natural presence from the goats one would think they read the script.